While idling away on Facebook, as is my usual pass time, I came upon Dr Leaf’s Facebook feed. There were her usual self-indulgent holiday happy-snaps and another couple of Pinterest-style fluffy inspirational posts. Then this: “Our genetic makeup fluctuates by the minute based on what we are thinking and choosing”. Dr Caroline Leaf is a South African born and trained, US based, communication pathologist. She also claims that she’s a cognitive neuroscientist. Given the quality of the posts on her social media pages recently, no one could ever take such a claim seriously. To make sure we’re all clear about what she just said, I’m going to say it again: “Our genetic makeup fluctuates by the minute based on what we are thinking and choosing”. It was an astonishing, if not bewildering statement, especially coming from someone with a PhD level education. If Dr Leaf were a medical doctor and publically made a statement like that, her registration would be reconsidered. DNA in our cells is like an old audio cassette tape. Audio cassette tape is a long magnetic stripe, storing the code which the tape player decodes as sound. DNA is a chemical string which has a sequence of “bases” off to the side. The full DNA molecule is made of two matching strings joined by chemical bonds between the bases (hence the name, “base pairs”). Depending on what the cell needs, it runs the DNA through a decoder to either copy it, or to ‘play’ it (i.e. using the information stored in the code to build new proteins). Like the tape in an audio cassette, the code of the DNA is incredibly stable. The rate of DNA mutation is about 1 in 30 million base pairs . DNA doesn’t ‘fluctuate’, (“rise and fall irregularly in number or amount” ). It’s not the stock market. The number of genes in each cell of my body does not rise or fall depending on whether I’m having a good hair day. 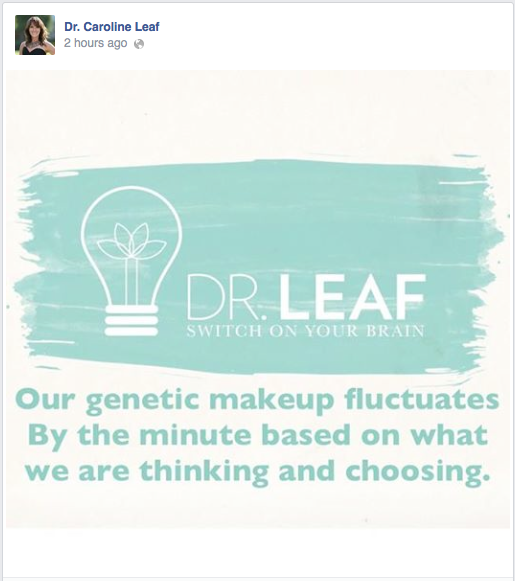 The other part of Dr Leaf’s statement, that our DNA “fluctuates … based on what we are thinking and choosing” is also scientific nonsense. The only way that your thoughts and choices are capable of inducing genetic mutations is if those thoughts or choices involve cigarette smoking or standing next to industrial sources of ionising radiation. I think Dr Leaf is trying to say that our thoughts and choices can change our gene expression, which is the construction of new proteins from the instructions in the DNA code. However, gene expression has nothing to do with our thoughts and choices. IVF embryos are expressing genes like crazy as they grow from one cell to an embryo in just a petri dish. It doesn’t think or choose. More often than not, our thoughts and our choices are the result of gene expression, not the cause of it. We don’t have any specific control over the process either. The process of genetic expression is dependant on a complex series of promoters and tags on the DNA, which are controlled by other proteins and DNA within the cell, not thought or choice. The truth is that gene expression occurs moment-by-moment, regardless of what we think or don’t think, do or don’t do. Gene expression is simply DNA being read. Our genetic makeup, the DNA code, is stable. It does not fluctuate. There is no part of Dr Leaf’s statement that is scientifically accurate. Ultimately, Dr Leaf continues on her pursuit of pseudoscience, an affront to the people who trust her to tell them the truth, and the God of all truth that she purportedly represents. This entry was posted in Biological, Caroline Leaf and tagged audio, brain, caroline, caroline leaf, cassette, cell, choice, choices, choose, choosing, code, cognitive neuroscientist, criticism, critique, DNA, dr caroline leaf, Dr Leaf, embryo, gene, Gene expression, genetic makeup, hair, ionising, IVF, Leaf, meme, mind, mutation, neurobiology, pseudoscience, pseudoscientific, radiation, science, scientific, smoking, stock market, thinking, thought by cedwardpitt. Bookmark the permalink. **This is not in defense of this “Dr. Leaf” character, but, instead, an appeal to the exploratory tendency of the human mind and the possible impact one could have if he/she decided to, instead of being simply skeptical of this resource of positivity for others, be helpful in the molding of this “resourceful” and probably very thoughtful individual who COULD be a very broad, positive, and possibly well-informed, future population of followers at your disposal. It is better to set an example than to simply criticize. So, consider the following contribution, a stream of curiosity**: It is not of the scientific process that respects the concept of “strong inference” (Platt, 1964) to assume that things are ONLY NOT possible based on imperfect, previously-acquired knowledge (assuming all knowledge and knowhow is “imperfect”, as we have to account for human error and the effect of gradual, stored-memory manipulation that are pervasive and permanent marks of human existence) without ALSO considering it’s alternative explanation with competitive, complementary likelihood, PRIOR to actually testing the hypotheses under controlled conditions. Understanding that it is in the very nature of scientific inquisition to assume that we do not know everything and, likely, will never know, especially as individuals, consider the following: The possibility of epigenetic influence or influence of error on an individual-cell level. Mutations occur all the time, due to simple and more complex “errors”, as far as we know; if they do not get picked up as “harmful” or, simply, the chemical pathway relaying this response is prevented or mitigated somehow, that’s how you get what we would call “cancer”, as soon as it becomes immunologically relevant and assuming this error is actually harmful and lends itself to the fast, pathogenic replication characteristic of cancer cells. Moods and emotions are a product of numerous structural, chemical, and chemically-intermediate factors (not to mention the chemically-determined structural patterns of cellular membranes, among other factors, the unknown, etc. ), and practically all of these factors can influence each other through the redundant qualities that have found [so far] in nearly every biological pathway in the human body that’s been discovered, isolated and replicated (via, both, in vitro studies and in animal models), at least, that I am aware of. Additionally, thoughts and patterns of thought influence and are influenced by what we subjectively identify as “emotions” and “moods”. If we look at these very complex inner workings, it may be POSSIBLE, via an ERROR (mutation) that follows and is a relative/indirect/direct-result of a series of strong epigenetically-influenced signals, for the template genetic composition to be altered on a single-cellular level, depending on the intensity of the signals, its source (assuming the signal is not an error, itself), and, therein, how widespread this signal is. Considering the impact of constant, moderate levels of stress on the heredity of “anxious”, “depressive” and “stress-reactive” behavior (as observed in vitro and animal studies, results of which appear comparable to what is observed in human case studies: Franklin, et. al., Biological Psychiatry, 2010; Nestler, JAMA Psychiatry, 2014; Heard and Martiensson, Cell, 2014; Gapp, et. al., Nature Neuroscience, 2014), it may be NOT completely unreasonable to suggest that alterations of thinking patterns throughout our lives may impact us on a genetic level, but, at what rate and frequency, I do not know and it seems that the scientific community can yet be certain about even just this factor’s hypothesis. To appropriately state another factor or sole source of hypothesized influence, producing the observed “heredity” of personality traits, moods, and psychological sensitivities: there are several publications discussing an observed trend and corresponding hypothesis for non-genetic heredity being of significance, either, alternatively, or as well (Calatayud and Belzung, Physiology & Behavior, 2001). It’s important to understand that, yes, this statement by “Dr. Leaf” was a gross oversimplification and mildly negligent to the respect her audience deserves in the informative-sense, but I do think that it was based off of pure, curious, and scientifically-inclined intentions, and I think it would be better to encourage better tact and inspire refinement instead of criticizing someone just because we might assume they were purposefully ignorant and attempting to manipulate a public audience into believing some sort of nonsense. This is comparable to what is not best done after a tragedy draws a lot of media attention, such as a recent case which involved a 51-year-old adult, male who shot and killed 6 of his grandchildren (ages 3 mo. to 10-years-old) and his own daughter (in her 20s, I believe): the story caused one of two reactions: people either responded with religious rantings and demonizing statements regarding this man (and I almost literally mean “demonizing”); OR they responded with an outcry for higher-quality and more-accessible mental health resources (e.g. the #IWillListen campaign received numerous submissions of cause-support from the nearest city, which, notably, is also home to a University, Gainesville, FL). The latter, to anyone in the psychiatric/psychological communities, is an obvious choice for the more ideal impact when dealing with these issues and the preventable tragedies that result from a lack of community resources. So, what I ask from others in the scientific community, especially those that are more vocal, like yourself, which method is best: a method which forces a wedge between those who are “educated” (or, in the least, “well-versed”) and their “less-education” peers who are willing to learn or are already trying to; OR a method which acknowledges realistic human logistics, behavior, and the complications imposed upon us by the constraints of time and the limitations of the human brain? We, those involved in the academic community, like to address ourselves as “educated” or otherwise, but this word has an allusion of finality to it, and, honestly, this concept of just learning some things and referring to one’s self as possibly being all-knowing, comfortably content with any resultant, prideful ignorance, is absurdly insulting to the definition of “science”. We are better than what some media has made us out to be. We are not just “debunkers”. We are the dreamers, the thinkers, and the doers, within reason and accompanying, compliment hypotheses. We are the makers of tomorrow, but with tried-and-true methodologies, appropriate, experience-based humility and a resolute need for understanding. This is all with an unwavering respect for and complete transparency within a community that we are a part of for the purposes of consistency and reliability of these methodologies, their results, and their interpretation to derive a particular breed of trust. This “trust” is what we employ as marks of our tribal membership. I am proud to be part of this scientific tribe. Thanks for your very insightful, articulate comment. I think you comfortably hold the record for longest comment I have on my blog thus far. I certainly needed an extra espresso before I started writing this response. And thank you for your constructive criticism, and viewpoint. Your comment raises many points, which I’ll try and cover as succinctly as I can. Starting broadly, I agree with your penultimate statement, “We are not just “debunkers”. We are the dreamers, the thinkers, and the doers, within reason and accompanying, compliment hypotheses. We are the makers of tomorrow, but with tried-and-true methodologies, appropriate, experience-based humility and a resolute need for understanding”. Scientists should be free thinking and should dare to dream big. However, I’m a clinician, on the front line, where I am confronted with the end result of pseudoscience on a daily basis. Most of the time, it’s relatively harmless (someone wasting $15 on a cough syrup that is inappropriately marketed as effective), but other times, people can waste tens of thousands of dollars, or suffer permanent injury, from non-science based ‘treatments’ (or from medical treatments used in non-evidence based ways). So as scientists and clinicians, we also need to be debunkers, to use the expertise that we have to promote the best knowledge that we have available. That’s not to say that we are always right, nor does it negate the autonomy of our audience to make their own choices. If someone wishes to try aromatherapy for their malignant cancer, that’s ultimately their choice, so long as they have been given the opportunity to understand the evidence pertaining to the pros and cons. If the evidence for either is skewed, then true informed consent can not be achieved. Of course, we have to accept that our knowledge, even the knowledge of experts, is always going to be in shades of grey, because there is no absolute black or white in the knowledge we possess, individually or collectively. As you have astutely noted, “it is in the very nature of scientific inquisition to assume that we do not know everything and, likely, will never know, especially as individuals”. Despite this uncertainty, those who have the expertise in a particular field should provide the best knowledge they have so that those without the expertise have the opportunity to make the best decision available for them. It is not my intention to personally criticise Dr Leaf, but to provide an alternative viewpoint that until now has been lacking within the Christian community. In my recent book, I have sought to provide both a critical analysis of the work of Dr Leaf, and the currently accepted scientific understanding of the nature of thought, stress and mental health (you’re welcome to review it, https://www.smashwords.com/books/view/466848. I’m happy to receive any constructive feedback you may have). I accept that the science is changing, and that even within the next few years, I will need to revise the text to keep up with the growing, evolving body of scientific knowledge. I don’t disagree with your opinion that it’s better to encourage tact and inspire refinement, thought there’s a limit. ‘Refinement’ implies that only a small amount of change is required to meet an acceptable correlation. However, if the message in question is diametrically opposed to the scientific consensus, then one can be as tactful as one likes, but no amount of refinement will bring a dissenting view in line with scientific acceptability. For example, there is still a very vocal minority that promotes the notion that the MMR vaccine causes autism. No amount of refinement is going to bring such a message in line with the scientific evidence. Similarly, Dr Leaf’s statement does not line up with scientific evidence. No amount of refinement is going to change that. I think it needs to be called for what it is. Specifically, you raise a number of points relating to DNA and epigenetics. I know from your e-mail address that you’re from Penn State, and from your language and use of references, I’m guessing you’re studying in the field of human biology or medicine. So you’re probably much closer to the coalface of current research than I am. I agree that DNA mutations occur all the time, but still, the rate of mutation is still very low, at about 1 in 30 million base pairs (Xue, Y., et al., Human Y chromosome base-substitution mutation rate measured by direct sequencing in a deep-rooting pedigree. Curr Biol, 2009. 19(17): 1453-7 doi: 10.1016/j.cub.2009.07.032). Most of them are harmless, and occur in quiescent cells. Epigenetic changes also occur, at the rate of about 1 in 25 (Bird, A., Perceptions of epigenetics. Nature, 2007. 447(7143): 396-8 doi: 10.1038/nature05913) and while it’s clear that epigenetic tagging is responsible for genetic expression, epigenetic tags often do nothing at all (Graff, J., et al., Epigenetic regulation of gene expression in physiological and pathological brain processes. Physiol Rev, 2011. 91(2): 603-49 doi: 10.1152/physrev.00012.2010). It ’s entirely logical that thought affects our genetic expression, since any neural activity can induce genetic expression in the same way that activity in any cell sometimes requires new proteins to be formed to support it. There is no evidence that neurological activity changes our DNA sequence. However, there is ample evidence that our mood, intelligence, personality and response to stress are all heavily dependent on our genetics (Caspi, A., et al., Genetic sensitivity to the environment: the case of the serotonin transporter gene and its implications for studying complex diseases and traits. Am J Psychiatry, 2010. 167(5): 509-27 doi: 10.1176/appi.ajp.2010.09101452 / Felten, A., et al., Genetically determined dopamine availability predicts disposition for depression. Brain Behav, 2011. 1(2): 109-18 doi: 10.1002/brb3.20 / Vinkhuyzen, A.A., et al., Common SNPs explain some of the variation in the personality dimensions of neuroticism and extraversion. Transl Psychiatry, 2012. 2: e102 doi: 10.1038/tp.2012.27 / Chen, C., et al., Contributions of dopamine-related genes and environmental factors to highly sensitive personality: a multi-step neuronal system-level approach. PLoS One, 2011. 6(7): e21636 doi: 10.1371/journal.pone.0021636 / Hosang, G.M., et al., Interaction between stress and the BDNF Val66Met polymorphism in depression: a systematic review and meta-analysis. BMC Med, 2014. 12: 7 doi: 10.1186/1741-7015-12-7 / Palazidou, E., The neurobiology of depression. Br Med Bull, 2012. 101: 127-45 doi: 10.1093/bmb/lds004 … and there are probably a lot more if kept looking through my references). So rather than our thoughts and choices changing our genetic makeup, it is our genetic make up, including our epigenetic tags, that change our thoughts and choices minute by minute. The difference is profound. Believing “my thoughts and my choices changes my genes” has a completely different outcome to “my genes change my thoughts and my choices”. This is why “debunking” incorrect science is so important. The former implies pure self-determination, whereas the latter fits our current understanding of the hierarchy of genes and the environment. I would disagree with your suggestion that “thoughts and patterns of thought influence and are influenced by what we subjectively identify as ‘emotions’ and ‘moods’”. That was Beck’s fundamental assumption when he proposed Cognitive Behavioural Therapy, however recent component studies (Dobson, K.S., et al., Randomized trial of behavioral activation, cognitive therapy, and antidepressant medication in the prevention of relapse and recurrence in major depression. J Consult Clin Psychol, 2008. 76(3): 468-77 doi: 10.1037/0022-006X.76.3.468) and therapies such as Acceptance and Commitment Therapy, show that the cognitive component of Cognitive Behavioural Therapy does not significantly influence mood or behaviour. In regards to your statement that “there are several publications discussing an observed trend and corresponding hypothesis for non-genetic heredity being of significance, either, alternatively, or as well (Calatayud and Belzung, Physiology & Behavior, 2001)”, I suggest you be wary of hereditary studies before about 2005. Modern genetic research accelerated in the mid-2000’s, making earlier studies inaccurate compared to newer studies using much more powerful genetic techniques (Naidoo, N., et al., Human genetics and genomics a decade after the release of the draft sequence of the human genome. Hum Genomics, 2011. 5(6): 577-622 http://www.ncbi.nlm.nih.gov/pubmed/22155605). I appreciate the time you put into your comment, and your desire to see science benefit the people in the communities in which we live. That is ultimately my goal as well, one which I work in on a daily basis as a family physician, and which my work with my book and on this blog will achieve. It’s not my intention to criticise for the sake of it, but to provide an alternative view that is concordant with the best scientific evidence available. Dr Leaf herself is welcome to comment, or to change her teaching to match the latest scientific evidence. Good luck to you as you complete your degree, and in your future study and occupation. I attended a conference on Friday evening called Healing begins with the Sanctification of the Heart, which is also the title of the book by Dr MK Strydom. Dr Strydom proposes that no disease is incurable and she started off the seminar by explaining how the neurons in the brain look like trees and toxic thoughts changing how the trees look and that our ‘thought lives’ are responsible for pretty much every disease known to man… Is this sounding familiar? Anyway, there was a break after a couple of hours and we slipped away never to return. Neither of us are scientists or doctors, but something definitely seemed off about the whole thing. At home I did some digging on the internet and found Dr Strydoms book in pdf format and had a quick look at the people she gave credit to – first and foremost, Dr Caroline Leaf ( her most favourite teacher and mentor) and pastor Henry Wright who wrote a book linking various sins to various diseases. I started googling these two characters and eventually stumbled accross your website and your wonderful book ‘Hold that thought’. Thank you sir, for providing such a clear and logical critique of Dr Leafs ‘teachings’, using current science and sound scientific principles to reveal what I believe is the truth. Have a look at Dr Strydoms book and see for yourself how Dr Leafs ‘teachings’ have crossed over the atlantic back to South Africa and arisen in a new guise. Please keep up the good writing, I look forward to reading the next piece. Thanks for the feedback. I’m really glad to have helped. As we say in Australia, ‘good on ya’ – for being open to your gut feeling, for being prepared to question what you’d heard, and for looking for an alternative. Please consider writing to the leader of the church that hosted the conference you attended, alerting them to your concerns. You’re welcome to cite my book if you wish. I will continue to pound away at the keyboard here in my home study, but the more people to politely request that Dr Leaf’s teaching is reviewed, the more likely that change will take place. Tell your friends too. You’re also very welcome to link to or share my book. Actually, it’s interesting that you brought up the book by Henry Wright – I was having lunch with a friend about a month ago, and he asked about the same book. I haven’t read the books by either Dr Strydom or Ps Wright, but I will have a look in my spare moments. Again, thanks for your feedback, and good luck. Hi JC. Thanks for your comment. I agree with you – epigenetics is very exciting, and will help to unlock a lot of medical mysteries that currently perplex us. I devoted a chapter to discussing epigenetics in my review of Dr Leaf’s work (https://www.smashwords.com/books/view/466848 or https://itunes.apple.com/us/book/hold-that-thought/id908877288?mt=11) and because the science of epigenetics is moving so fast, I think a full rewrite of that chapter will be required when I revise the book early next year. Though personally, I think we need to be careful of reading too much into these initial discoveries. The article you referenced discussed a lot of interesting connections between early life stress and future mental and physical health, but these are still at the level of association (“early stress and mental illness occur together”), but I haven’t seen any studies proving causation (“early stress definitively causes mental illness”). Even if it were definitely proven that early life stress was a significant factor in future mental illness, that still disagrees with Dr Leaf’s notion that it’s our thoughts that change our genetic expression, since these early childhood traumas are external to the child and out of their control. Anyway, time will tell. I’m sure they’ll be a few surprising discoveries along the way as scientists continue to research this fascinating field.